My name is Cliff Wagenbach of Tower, MN and I offer guided walleye fishing trips on the East End of beautiful Lake Vermilion. Lake Vermilion is approximately 35 miles long with 1200 miles of shoreline and 365 islands. You are going to need more than luck if you want to find the best walleye fishing hot spots. I will take you there. I will guide you to a safe, comfortable, and productive day on the water. My main objective on any trip is that my clients have an enjoyable time and to educate my clients on how they can catch more walleye on their own. Check out some of our favorite WEB LINKS! 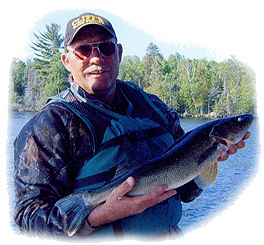 Over 40 years experience; 25 years guiding on Lake Vermilion. Boat, motor, gas, bait and all terminal tackle is provided. Rods and reels are also available if needed. Half (4 hr) day/rate is available - plus a special 6 hr day rate. I will pick you up at your resort or other location. There are many fine resorts and a casino located within easy distance of my business. I will pick you up by water at any lodging location.